How did Newton contribute to our understanding of the universe? In his work Philosophiae Naturalis Principia Mathematica (“Mathematical Principles of Natural Philosophy”), or just Principia, Newton articulated the law of universal gravitation and his three laws of motion. He also described, in other works, major advances in many areas of knowledge. In optics, he showed that sunlight is really a combination of many colors; in mathematics, he developed new methods that form much of the modern foundation of mathematics, including the calculus, which was also developed by German philosopher and mathematician Gottfried Wilhelm von Leibniz. In cosmology, he supplied a theoretical framework that modern astronomers used to calculate the density of an expanding universe; while in astronomy, he invented a kind of telescope that uses mirrors rather than lenses. It is the basis of all major astronomical research telescopes built today. 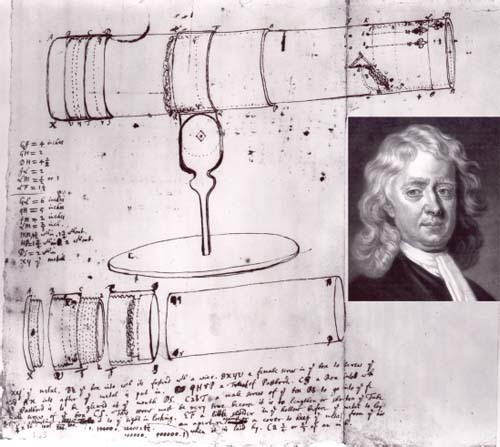 Isaac Newton (inset) and an illustration he drew of the telescope he invented.